Wine Bottle Dimple! What is that concave dimple at the bottom of your wine bottle for? What is it called? Where did it come from? And why don’t they just make bottles flat? The wine bottle dimple is Annabelle’s topic for today. To find out all about the wine bottle punt, watch now. And stick around for Annabelle McVine’s bonus wine trivia at the end of the show about wine bottle punt quality. What is the dimple at the base of our wine bottle? 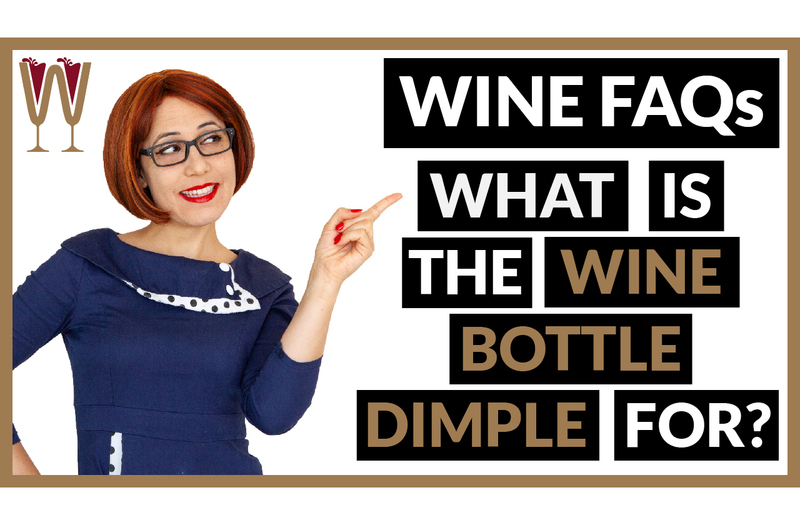 I really enjoyed researching this topic and can’t wait to let you know all the fascinating facts I have found out about the wine bottle dimple! And stick around till the end for a bonus tip on the correlation between the depth of the punt on your bottle and the quality of the wine within. By the way, Tasters, if you enjoy WineScribble videos, let us know by hitting the Subscribe button and the notification bell. It makes a huge difference! So, this little indentation at the base of wine bottles is actually called a punt. But what’s it for? The short answer is: Nobody knows for sure. There are several possible explanations. I have selected the three most credible ones to share with you. One explanation for the punt is that it was a feature that allowed for greater structural integrity of the bottle. This was crucial for sparkling wine, that placed a lot of pressure on the glass, at a time when glass tempering had not been fully mastered. This, of course, is no longer a matter for concern. Another explanation for the punt is that the ring shape created by the punt makes it easier to collect the sediment created by aging wine, making it easier to pour clear wine. This is another feature that is pretty much obsolete, however. Modern wine generally is free of sediment and most of us do not drink bottles that are old enough to shed big amounts of colour. The most likely explanation for the existence of the punt, is that it is a remnant from the time when bottles were freeblown using a tool called a pontil rod or, tellingly, a punty. This long rod allowed the holder to shape the molten glass without getting their hands burned. When the bottle was finished, the rod was snapped off the base, leaving a scar, or punt, behind. So why has an obsolete feature persisted so long? The biggest reason is probably that wine enthusiasts love tradition. However, there might be at least one practical reason for the punt’s survival. Wines are best stored lying on their side. The punts allow for bottles to be snuggly stacked tip to base, without rolling around, minimising the possibility of shattering. By the way, if you want to know more about the correct way to store wine, head over to WineScribble.com and check out our quick overview on wine storage. I will leave a link for you in the Description below. Also, don’t forget to check out our video Prosecco showdown, in which we compare two 10 euro bottles of Prosecco to see which one pairs best with crispy fried calamari. Find out which Prosecco won by clicking on the link in the Description below. And now for my bonus tip: is it true that the deeper the punt, the better the wine? In a word, no. A bottle with a punt is slightly more expensive than a flat-bottomed one, but the difference is very, very small. No clear correlation has ever been shown to exist between the depth of punts and the quality of the wine. Just as you shouldn’t judge a book by its cover, the only way to safely judge the contents of a wine bottle is to open it!